I'm starting teaching guitar more seriously now and was wondering if there was some sort of setup you could do where you can play two guitars through the same amp. I want to play along with my students while I teach them, but I have the problem of space in the room where I teach. Also I would like to buy one good amp instead of two smaller ones for the venue. Plugging two guitars into a guitar amplifier that is designed for one guitar at a time, can be done - but it's not recommended for reasons suggested in other answers. You can find many guitar amps billed as "two channel" amps, but many of these are still intended to amplify only one guitar at a time. They might have a "clean" channel and a "dirty" channel and are intended for one guitar to be able to play through either one or the other. But they only have one set of controls so plugging a guitar into each channel is probably not a good solution for what you are trying to accomplish. However, there are amplifiers available that have two independent channels - each with its own separate preamp and each with its own set of individual controls for the intended purpose of amplifying two separate instruments. Most of these true two channel/two preamp combos are billed as "acoustic" amps but are fully capable of amplifying any electric guitar. They just won't have the "dirty" distortion/overdrive effect that an electric guitar amp might have, but you can use a distortion pedal to get that effect if desired. If you choose this solution, be sure the amp has two instrument inputs. Many of the "acoustic" amps have an XLR input for one of the channels so you can use it for guitar and vocal. 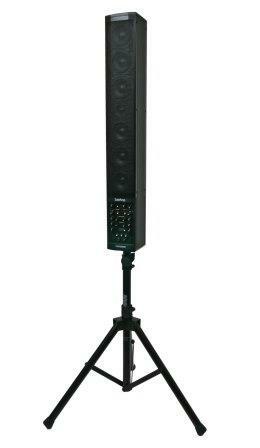 But many of these also have an instrument input available to use on the channel with the XLR (use one or the other). You also want to be sure each channel has its own dedicated volume and tone controls. Using a two channel amp with dedicated controls for each of two guitars would allow you and your student to both plug in to the same amp and then adjust the tone and volume independently for each guitar. Below are some pictures of a few examples of the type amp I am talking about. Another option that might even be more space efficient if you don't mind spending a little more - would be a line array portable PA system such as the Fishman SoloAmp SA 220 (pictured below) which has two channels with dedicated controls. 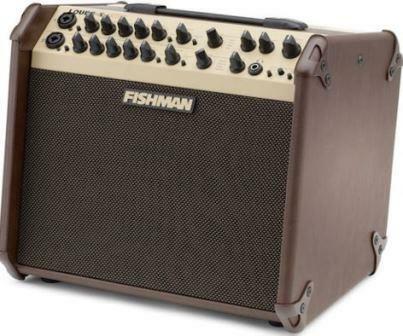 Either of the two channels on the Fishman SA 220 can be used for an instrument or a microphone. Something like this could also be used if you wanted to set up a public recital for an audience to showcase one of your students. It is possible to mix the signal of two guitars before going in the amp. You can even plug two simultaneously into a single input with a simple Y-adaptor; you can mix the relative loudness with the volume pots (though it will be fiddly). A small mixer gives much better control, but the impedance of the line input on such mixers is usually rather too low for passive guitars, so don't expect it to sound great. Note that, no matter how you mix the signals, if they pass the entire preamp together you will get some problems. Obviously, they'll share tone etc. controls; but a much worse issue is that, unless you're operating the amp completely clean, you'll get intermodulation between the two guitars (what papaklas calls “one guitar distorts the other”), and that sounds really weird. One good solution, if applicable, is to use the effects loop as an extra point-of-entry. Plug one guitar normally into the amp, and the other into any digital amp simulator. Then route the amp's effect send into the amp-sim's aux in, and the amp-sims output into the amp's effect return. Because the effects loop is usually behind the preamp, you'll only mix the signals after most of the distortion, and thus get relatively clean seperation, as well as separate gain & tone controls: one guitar via the amp, the other via the amp-simulator. it is possible with an adapter from 2 jacks to 1 but since it is 1 channel you may experience one guitar distorting the other. I have tried it but the result was not very pleasing to the ear. Most answers are focusing on the question as written, i.e can this be done, and the answer is of course yes, with the right equipment. It is however, not a good idea, because (even if you avoid issues like distortion intermodulation) having the sound of both guitars coming from the same speaker makes it difficult to distinguish who is playing what. This is especially important for a student, because, without that separation, they may be completely unable to hear when they are playing right, and only hear any grossly out of place notes when they jar with the teacher's playing. I strongly recommend that the student buy their own practice amp. A quick Google search shows that Fender make a 10W model that retails for 42 GBP (approx 60 USD.) They can (and should) use this at home to practice playing to avoid bad habits such as making pickup noises, playing too hard or not palm muting correctly (playing through an amp is not the same as unplugged.) Once they have their own amp, the issue of playing two guitars through one amp goes away. A lot of guitar amps have two inputs - often 'high' and 'low'. Either or both can be used, so two guitars will work this way. The obvious problem is that whatever tone and volume the amp is set at, it will be the same for both guitars. Maybe not ideal. A better idea is to use a small mixer (I have a few Behringer mic mixers which do a similar job) to plug instruments into, and it into the amp. this way you have tone and volume control avaiable to possibly 4 guitars simultaneously. You could always use a small p.a. amp, or keyboard amp, both with several inputs. Any effects can be plugged in through send/return, or direct. Since it will be beginners, I suspect, then a brilliant sound for guitar may not be needed yet. Get a decent amp with at least a 10" speaker - 12" is better, and minimum 20-30 watts. Tim's mixer suggestion is probably the best way to get started with minimum outlay. A two channel amp might be another option. I use an old Fender Princeton Chorus, which is a smallish 50W 2x10 solid state combo. The clean tones and stereo chorus are really nice, but of relevance here is the fact that you can plug in two guitars and effectively you have two separate 25W/10" combos in the same cabinet. I do this to play along with my daughter, and it sounds pretty good. These still go quite cheaply on eBay I think. I don't know what modern equivalents there are, but imagine they must exist. If one needs to have two or more guitarists playing for a group, it may be helpful to have guitar feed a dedicated monitor speaker, but have most of the sound come from a PA amplifier which is fed both. For many musicians, however, it will be important to have at least some of the sound for each guitar coming from a speaker which is dedicated to that instrument. 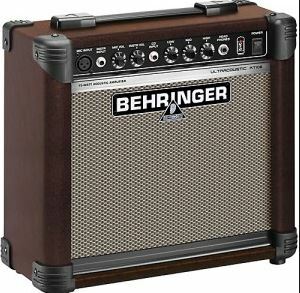 While larger amps sound much better, I've seen practice amplifiers the size of a deck of playing cards; if a room is large enough to hold two musicians and two guitars, it will be large enough to hold two of some kind of practice amp. Another solution is to get a micro mixer which is a small inexpensive unit that can take up to 4 inputs and combines them into one output to your amp. 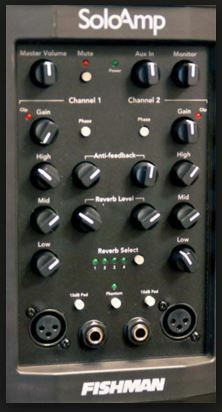 Each input channel is controlled with a seperate volume control and the output has its own volume also. An ideal unit is a Leem - Wam 290. See https://www.ebay.com/p/4-Channel-Micro-Mixer-Leem-Wam-290/733364992. I use this for mixing together guitar with an iPad from the headphone jack. Works well without compromising sound. Not the answer you're looking for? Browse other questions tagged electric-guitar amplifiers or ask your own question. How do you connect multiple guitars to a single output? How should I wire multiple speakers for a live performance? Are guitars getting older in shops while waiting for someone to buy them?